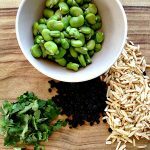 How to make quinoa a success with your family! Quinoa is so much more than a grain with a weird name. In fact, quinoa (pronounced kin-wah) that we eat, is not a grain at all it’s a seed. Originating in Peru & Bolivia this ancient grain is packed full of nutrition and is rightly named as a super-seed by some experts. Quinoa can be used as a substitute for rice or couscous because unlike wheat or rice, quinoa is a complete protein and packed full of essential amino acids. It has a rice like appearance in size and fluffs up when cooked and you can liken the taste to a nutty flavour. Rachel: My boys are huge fans of Mexican food. They love to make healthy nachos, enchiladas, tacos, and burritos. I typically always made a batch of mild Chilli Con Carne as the base for these dishes, but as simple as it is, sometimes I just don’t have the time or don’t have mince on hand to be making it in the traditional way. I needed a quicker and easier option for times like these. I have found using quinoa instead of meat is just as tasty, takes half of the time to prepare, and best of all is still 100% kid approved! There are also some great health benefits to eating quinoa, it’s protein rich, high in fibre, and also a fabulous source of iron. What I love most about this dish is you literally just throw it all in one pot and let it do its thing! The first time I cooked this for my family I served it on a bed of organic corn chips (nachos style) as I have found when serving something new to my boys, it helps greatly to have something I know they love and are comfortable with on the plate – I knew once they saw they were getting ‘chips’ with their dinner they’d be inclined to give it a go. It worked. It is also helpful to serve food up to fussy eaters using some fun and colourful dinnerwear. Our other favorite way to eat this dish is with sweet potato chips. My boys love it served up either way. Rinse quinoa well until water runs clear. Warm olive oil in a large saucepan over medium heat. Add quinoa, stock, cannellini beans, black beans, tin tomatoes, corn, and spices and stir well. Bring to a boil, and then reduce the heat and simmer for approx 20 minutes or until quinoa is cooked through. Serve with either organic corn chips or sweet potato chips. Heat coconut oil in a saucepan. Add the spices and cook for a couple of minutes on low heat to bring the flavour out. Add in the rinsed quinoa and stir through the spices. Add the stock and bring to a boil. Cover with a lid and reduce to low heat and cook for about 15 mins or until the quinoa has absorbed all the liquid. 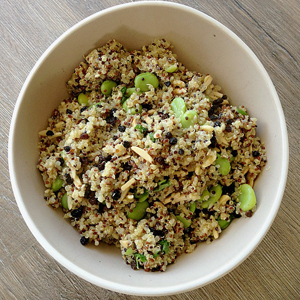 Once the quinoa is cooked, add the currants, almonds, coriander, and broad beans and mix through.